NITT is located in Tiruchirappalli, India (in the state of Tamil Nadu) , a city of over one million people commonly known as Trichy. They've been very generous, creating and contributing a number of cool tools to Microwaves101. We've also listed the NITT events further down on this page - if you're ever in their neighborhood, stop by for a visit! Dr. S. Raghavan of NITT has been a contributor to Microwaves101, with regard to finline. 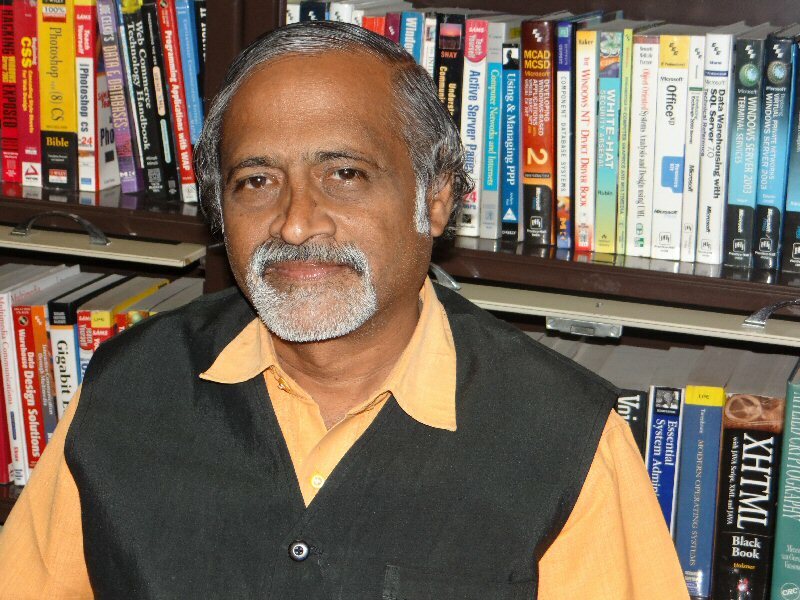 He also holds the distinctions of being the final Ph.D. scholar of Prof. B. Bhat and being a Senior Professor at NITT. Here is his contact information and qualifications. His interests include microwave integrated circuits, biological effects of microwaves, computer aided design, and meta materials. He is a Fellow or Senior Member of 18 technical societies. Check out the NITT website at Electronics and Communications Engineering Department. Here is an article of Microwave Engineering Made Easy, which describes the NITT educational experience. Professor Muthu Ramya is interested in microwave research, and she also an artist. Check out some of her work over on her blog! Here is a description of a project that NITT performed for a Smith Chart tool, just one example of what students at NITT ECE are doing. Much of the credit goes to Mr. Arpit Raj, who was in his final year Electronics and Communication Engineering in 2010. He is a web team member of the college and contributed to the Microwave Engineering Made Easy article as well. Update March 2016: In the microwave world, we are always looking for interactive ways to play around on the Smith chart. In the document below, Bharath Krishna shows how to create a Smith Chart in Java. New for October 2013: NITT student Lakshmi Nairhas contributed a transmission line calculator. Read about it here. Thanks! New for March 2013: check out Dr Raghavan and Prof Suganthi's poster on Women in Microwaves! 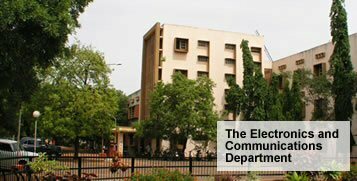 May 2019: The Department of Electronics and Communication Engineering of National Institute of Technology Tiruchirappalli, one of the prominent Engineering Institutions in India, takes immense pleasure in organizing an International Conference on Microwave Integrated Circuits, Photonics and Wireless Networks (IMICPW-2019). This conference will provide a forum to academic researchers, practicing engineers, and industry experts to present and discuss their recent work, technical advancements, and new products. Main objective of IEEE IMICPW-2019 is to provide a platform for the community of researchers and practising engineers to meet and present their latest technical achievements in microwave and RF components, circuits & systems, photonics and wireless networks. For more info, see the IMICPW website. New for August 2015: an update from Dr. Raghavan on his microwave students and sad news from India. 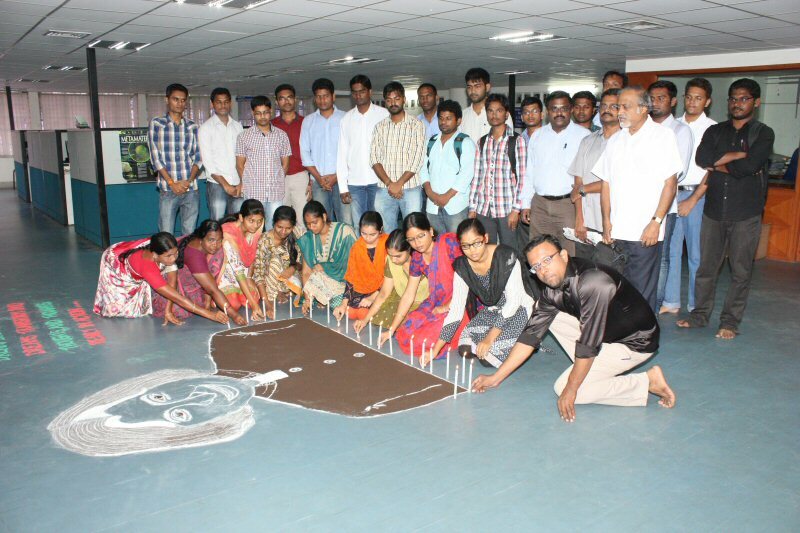 Below, the MICROWAVE Group of National Institute of Technology Trichy, India has paid respects to the Space scientist Dr.A.P.J.Abdul Kalam in an unique way. To make his coat appear as natural as it was during his last speech in Indian Institute Of Management (IIM), Shillong, the students used tea powder in the floral decoration. He was the Project Director of SLV_3 in 1980 and had a keen interest in MICROWAVE Engineering. Dr. A. P. J. Abdul Kalam died on July 27,2015. He served as president of India from 2002 to 2007. He was a first a scientist, and became a politician later. Over 100,000 people attended his services. He wrote 17 books, including an autobiography you should consider reading to learn more about his life. New for September 2014: a recent lecture was given by Ms. Seema R. Tirky (first year post graduate) to bring awareness of Microwaves101 web site to other students. Thanks for spreading the word, we hope that Microwaves101 lives up to your expectations! Click the images for higher resolution photographs. On the right, the electronics and communication engineering association office bearers of 2014 are shown. Also during this month, Microwaves101 offers congratulations to the Indian Mars Orbiter Mission Mangalyaan, that entered orbit on 24 September 2014. Bravo! All health parameters of the Mars Orbiter Mission (MOM) are normal and the its performance will be as per the computed time” said the proud scientist and the project Director of MOM S. Arunan few days before in NITT during his talk to the Electronics and Communication Engineering association students. His words came true when the whole world witnessed Indian Space Scientists' latest space marvel Mangalyan being put in orbit around Mars at the very first attempt. Along with the whole country, the Microwave group, are jubilant for many reasons. Starting from N. Valarmathi. the Project Director of Radar Image Satellite (RiSAT), P.K. Anuradha, the Project Director of GSAT 12 and finally MOM Project Director Arunan had inspired every student of the department to aspire to become space scientists. The Microwave group headed by Dr. S. Raghavan, Professor, and the ECE department celebrated with great joy and satisfaction. The scholars and the students had designed the colorful model of the MOM in the form of rangoli. Microwave Engineering has played an active role in the mission. One of the present scholars of the Microwave group, Mr.S. Purusothaman is from the Compact Antenna Test Facility (CATF) of ISRO, Bangalore where High Gain Antenna of Mars mission was exclusively tested for the radiation pattern, gain polarization and isolation before integrating with MARS space craft. The communication systems for the Mars mission are responsible for the challenging task of communication management up to a distance of 400 million km. One student Nitesh Jha from Nepal has told that he feels proud to study in India where extraordinary achievement on space science had happened. Another scholar wished that ISRO should excel NASA in space research. Other proud comments include , "Super power" is exhibited , at the rate of 11 Rs/km the mission is the world’s cheapest interplanetary mission , "the cost is lesser than the budget (100 million dollars) of the English movie ‘Gravity’ ", and "I will work hard to become a space scientist’". For any space mission volume and weight are very critical and the biggest advantage of microwave is miniaturization. The group is doubly happy to see the practical usage of Microwave Engineering in the space mission which made India scale high! under the guidance of the research scholar Ms. Imaculate Roselin. New for July 2013: Dr. Raghavan has organized a conference on CAD in microwaves on July 27-28, 2013. Download the poster, and download the registration form. New for June 2013: Dr. Raghavan has organized a three-day conference on Telemedicine (merging medical and engineering practices) at NITT on July 12-14. Here you can learn about many topics including tele-cardiology, tele-opthalmology, tele-anaesthesiology, tele-pathology, tele-diabetology, tele-radiology, stem cell engineering, bio implantable antennas and more. Download the poster and display it at your office or school to show your support! March 2013: Here are two new pictures. March 8, 2013 was International Women's Day, which was celebrated in advance by NITT faculty and students. Below is the photo of the first ever female project director of ISRO, Dr.P.K. Anuradha who was the head of GSAT-12, along with the student organizers of the Electronics and Communication Engineering department , N.I.T., Trichirappalli. You will notice that women are well represented in this group, click on it to see their smiling faces! 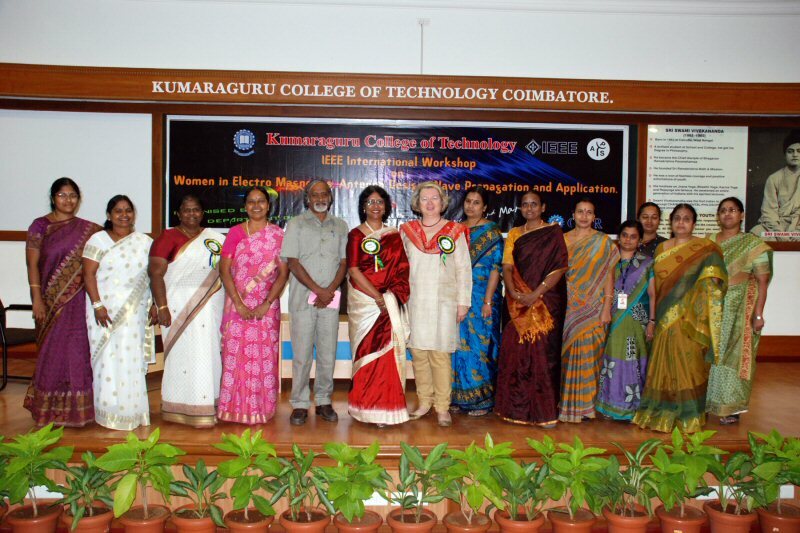 Below are Dr. Praveen Wahid, USA, Dr. Salazar Palma of Spain, coordinators of WiE 2013 , along with Microwave Pioneers of TamilNadu. Microwave Group of NIT-T for a change formed ONAM POOKALAM using MICROWAVE INTEGRATED CIRCUIT antennas (ten types of antennas instead of ten rings found in the conventional pookalam viz. fractal antenna, patch antenna, implantable antenna, metamaterial antenna, RF ID, smart antenna, UWB antenna, spiral antenna, Yagi antenna, and sector antenna) chips designed and fabricated by the research scholars. Each small chip antenna has its own significant advantages. This Pookalam made up of small antennas propagate the joy of the integration festival ONAM. Floral Design, traditionally known as POOKALAM is the hall mark of the colourful harvest festival ONAM. Pookalam that is supposed to please KING MAHABALI is normally consists of ten rings, each representing a god is made during the onam celebration (Atham to Thiruvonam). Flowers like thumba, kekka poovu, chemparathy, thechipoovu, mukkutti, aripoo, hanuman kireedam, and chethi. It sometimes denotes Nakshatram of the day. And we have two more images here and here for your enjoyment. Below is an image of the NITT ECE class taken when Scientist N. Valarmathi gave a technical talk about satellite communication. Read about her visit here. Ms. Valarmathi is the first woman to head a remote sensing satellite project for India, the indigenously developed Radar Imaging Satellite RISAT-1. Valarmathi is the second woman to serve as satellite project director at the Indian Space Research Organisation (ISRO) after T. K. Anuradha, who headed the communication satellite GSAT-12 program. Read more about Valarmathi in The Hindu. Thumbs up for future microwave engineers! Dr. Raghavan and Ms. Valarmathi front and center.